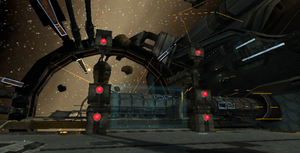 Exterior Docking Hangar is a room where Samus first lands her ship at the Frigate Orpheon and the first room Samus enters in Metroid Prime. The area is surrounded by orange force fields, which prevent Samus from returning to her gunship or stepping into the vacuum of space. There are two other blue force fields Samus must disable by shooting targets; the second set of these targets are inactive and must be activated by scanning a small terminal before they can be disabled. This room includes the docking area that appears open to the vacuum of space and a separated hallway referred to in scan data as the "Main Docking Bay." From here, Samus has an excellent view of the planet below the frigate and surrounding space, including several nearby star clusters and an asteroid field. Asteroids that stray near the frigate beyond the screen of the force fields can be shattered by a shot from her Power Beam. After venturing through and exiting this room, Samus does not need to return to it until she is escaping the destruction of Frigate Orpheon. When she does arrive a second time, Samus heads straight to her gunship and leaves, following a fleeing Meta Ridley. Energy Force Field in place. You cannot reach your gunship. This switch is directly connected to the Force Field barrier. This Force Field blocks the entrance. Something nearby must be able to deactivate it. This Force Field blocks the entrance. You cannot deactivate the Force Field unless the switches are red. This switch does not seem to be operational. The control panel on the pillar in this room can turn it on. Force Field activation switches are now online. The section of hallway in this room is called the "Main Docking Bay" in scan data, but is included as part of the Exterior Docking Hangar on the map. There are slow-floating asteroids floating around Exterior Docking Hangar; Samus can shoot and shatter these rocks. Exterior Docking Hangar is the first formally named room in which Samus sets foot. This page was last edited on 3 May 2013, at 02:19.